"This is a fantastic story fellas. Two Yankees playing in the 'House that Ruth Built,' both going after his record. It's great for baseball." Mickey Mantle (Thomas Jane) hobbles up to the plate at Yankee Stadium in nearly unbearable pain. Playing with a pulled muscle in his forearm, a bum knee, and a score of other injuries, he's merely surviving on his unrelenting will to compete. The crowd rises to its feet and expects to see their baseball hero shine again. But Mantle only has the use of one arm, and their hopes for another home run appear futile. Then it happens. With one unbelievable swing, he slams the ball over 450 feet into the stands. This moment is the essence of Mickey Mantle and provides a perfect explanation for his mythic status in baseball history. 61* captures the magical atmosphere of one of the most memorable summers of all time. Following a season where Roger Maris (Barry Pepper) and Mantle battled for MVP honors, both men begin the 1961 season under extreme scrutiny. Babe Ruth's supposedly unbreakable record of 60 home runs in a single season stands as the pinnacle of individual achievement. Do these two superstars have a chance to surpass this total? This film takes an intimate approach and looks closely at both men and their polar personalities. Bolstered by tremendous performances from Pepper (Saving Private Ryan) and Jane (Under Suspicion), it successfully conveys their experiences during this infamous seaon. Director Billy Crystal (Forget Paris, Mr. Saturday Night) possesses an immense passion for the game of baseball, especially the Yankees, and his dedication to the story lifts it to another level. Instead of simply retelling the events in a straightforward, easy manner, he tries to cover each side of the story and its emotional context. We see the varying members of the press who spend much of their time tearing down Maris and his humble personality. Hank Steinberg's writing paints a clear picture of the camaraderie between teammates that transcends concern about individual statistics and record. There's also material about the business side of the sport, with management urging the players to go for home runs because it draws more fans. The overall result is a surprisingly effective mixture of personal drama and grandiose moments. 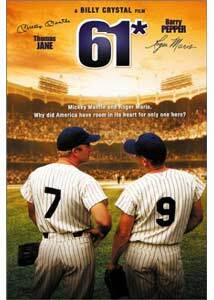 The heart and soul of this film is the modest, stoic personality of Roger Maris, who refuses to change his attitude to appease his critics. Unfortunately, this leads to an even greater uproar that nearly forces him into a mental and physical breakdown. As he continues to crack home runs and approaches the record, Maris' turmoil increases, and the effects are devastating. An unbelievable season becomes a vicious struggle against voices who believe he lacks the right attributes to hold the record. Barry Pepper does an excellent job in depicting the strong will of this misunderstood man who just wants to play ball and do well for his family. His troubles are always believable and saddening due to his understated portrayal that remains realistic and touching. Mickey Mantle was a fun-loving, reckless guy who charmed everyone he met with his handsome looks and flair from drama. Yet, his personality also was kind and straightforward, which lead to a strong bond with Maris. Contrary to public sentiment, they were not feuding personally about the record. Some of the film's best moments include their daily conversations about baseball and dealing with the pressures of public life. Although both strive to reach the record, their friendly competition pushes the other to greater heights. In 1998, Mark McGwire edged Sammy Sosa and culminated the most memorable baseball season in recent history by breaking Maris' record in dramatic fashion. 61* begins and ends with highlights of his run, which helps to bridge this nostalgic story to the present day. The final moments once again reveal the power of sports to transcend the basic elements of the game and become pure magic. Image Transfer Review: 61* majestically recreates the Yankee Stadium of 1961 through a combination of computer technology and inventive set design. The bright colors of the stadium jump from the screen and create a warm, nostalgic feeling. The 1.85:1 anamorphic widescreen transfer shines with a clear picture that increases the enjoyment of the story. The screen is virtually devoid of noticeable defects, and everything appears in top-notch form. This is one of the best transfers I've seen on an HBO disc, and it sets the standard for the studio's future releases. Audio Transfer Review: The 5.1-channel Dolby transfer on this disc brings the sounds of baseball to life with excellent clarity and precision. When the home runs crack from the bats of Maris and Mantle, the effect resounds throughout the sound field and creates an intimate feeling of being at the ballpark. The numerous songs from the era and the score utilize plenty of power to help to present the story. While this track works nicely, the surround speakers aren't used as prominently as on the best audio transfers. This prevents the presentation from rivaling the best discs, but it hardly lessens the effect of this well-done track. Extras Review: 61* contains a nice collection of supplements that provides a impressive overview of the creation of this moving film. While most HBO releases lack significant extras, this disc includes several worthwhile features. The highlight is a 52-minute documentary—The Greatest Summer of My Life: Billy Crystal and the Making of 61*— that conveys atmosphere and emotions that are similar to the film. Much of the time is spent with Billy Crystal, who leads us into Yankee Stadium and describes his experiences there as a young boy. During his adult life, Crystal and Mantle became friends, and this helped to make the story more authentic. A special bonus on this documentary is interviews with the Mantle family, including his wife. There's also plenty of enjoyable behind-the-scenes footage of baseball tryouts, instruction, and the actual shooting of the games. The other major extra is a feature-length commentary track from director Billy Crystal—the driving force behind this film. From the very beginning, he starts chatting about the story and doesn't let up until the end of the closing credits. His demeanor is very down-to-earth and enthusiastic with plenty of interesting material explained throughout the track. In one of the best moments, Crystal attempts to present the complexity in shooting baseball games in an exciting manner. During one bunting play, he counts 22 camera shots within a extremely short sequence. Throughout the film, Crystal incorporates an abundant amount of historical and technical information, and this leads to both an entertaining and educational experience. This disc also includes cast and director bios, a widescreen theatrical trailer, biographies and career statistics for Mantle and Maris, and a specific list of all of Maris' home runs in 1961. The cast entries only exist for Thomas Jane and Barry Pepper, and both are pretty brief. On the other hand, the stats are extremely specific for both players, including such numbers as intentional walks, double plays, and much more. I was born fifteen years after the historic season of 1961, but its effects still resound strongly through the excellence of 61*. Ranking among the top echelon of baseball films alongside Eight Men Out and Field of Dreams, this story will charm fans of the sport and perhaps reveal its allure to naysayers who believe its time has passed.